I don’t know if it’s good to admit this sort of thing, but right now, I have a problem. Gosh, this feels a little like I am about to break out with, “My name is Carrie and I am addicted to doughnuts”. I think having a doughnut addiction might be easier. 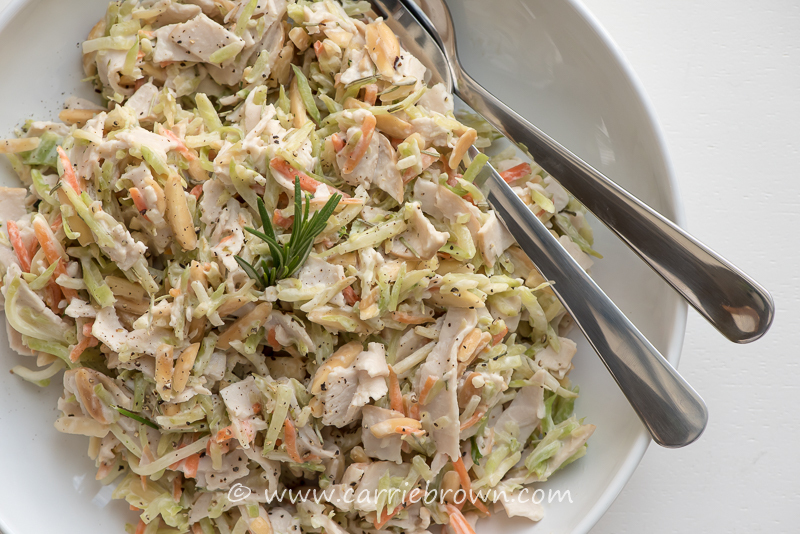 This Warm Turkey and Almond Slaw saved the day though. The truth of the matter is I’ve got too many ideas and too little time. Add to that my refusal – or inability – I am not sure which, to write notes in the moment that I get these nuggets of inspiration. By the time I am lying in bed at night, my brain is just a hot mess. I feel like one day I will wake up and find my head will have channeled itself into something resembling a grilled cheese – crispy on the outside, warm and gooey in the middle – oozing out all over. A simple notepad and a sharpened pencil would transform my life, if only I let them. It’s the little things, people. I realize that in some circles this might not be wise to publicize – since it really doesn’t inspire confidence – especially because the folks I work with think I totally have it all down in the got her act together department. But I don’t want to lie – especially here – because you lovely people keep stopping by to give me the time of day, it’s the least I can do to be honest. Because I want you to know that I am doing my best to create scrumptious low carb stuff for you, but sometimes most of the time it takes me longer than I’d like to get things posted. And because there is so much else that I want to say that I think might help you on your journey to health. Or not even just that – this journey called life. Here’s another one of those One-Pan-Wonders that I am so fond of throwing together when it’s just me and 5 cats around the dining table. 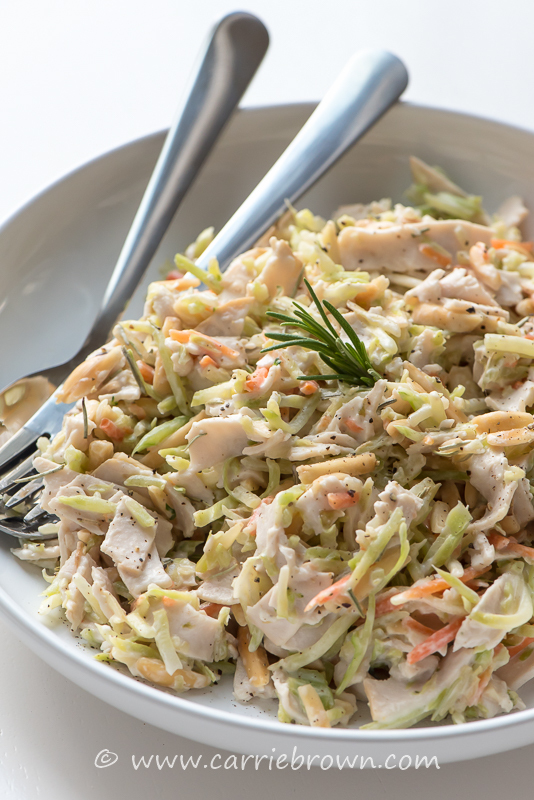 I would like to introduce you to Warm Turkey and Almond Slaw. 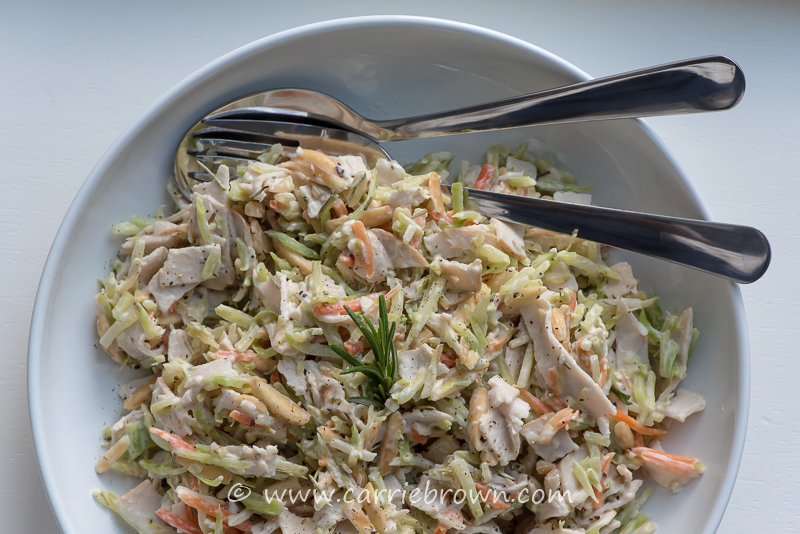 Now I have a hearty appetite, so I made this Warm Turkey and Almond Slaw recipe for one. I must confess that half way through eating it I was so full I had to admit defeat. So I changed the recipe to say “serves 2”. I don’t know if I was more floored by the food, or by the fact that I had been floored by the food. Either way, this is filling. You have been warned. Make it tonight. And then go out to play, because you’ll have so much spare time that you didn’t need to spend on cooking or dishes. Love that. Heat the coconut oil in a skillet over high heat. Add the broccoli carrot slaw and the almonds and stir-fry for 2 minutes, stirring constantly. Add the strips of turkey, stir and cook for 1 minute. Add the dried rosemary and gently stir in the yoghurt. Add the balsamic vinegar, stir well and season with salt and pepper. Heather Carson - I totally can relate to the “too many ideas, too little time”!